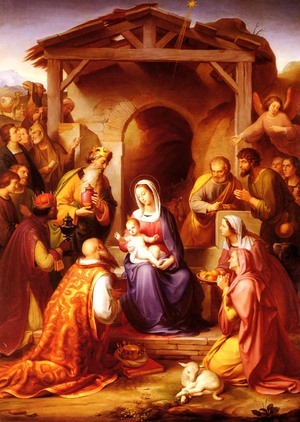 Nativity. There are few Christmas images as loved as the creche, or nativity scene. to childlike images made from clothespins and Popsicle sticks. And everything in between. 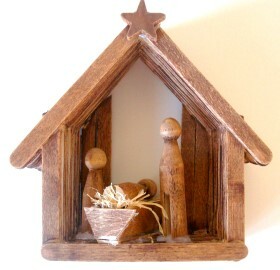 Every Christian church will have a nativity scene somewhere at Christmas. Our parish brings the infant Jesus to the crib to be placed there and the crib scene blessed at the beginning of Midnight Mass. At the children's masses, the kids are asked to bring the baby Jesus from home to have the figures blessed. 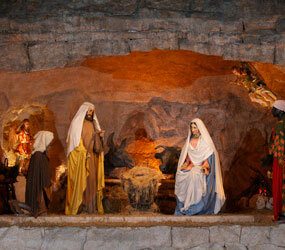 Many families have nativity scenes in their homes as well. 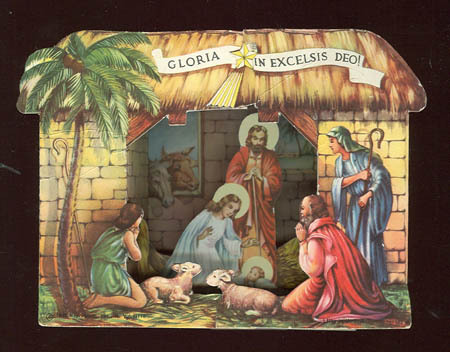 I remember the first nativity we had came from Sears in 1977. All of the plastic figures were glued onto the wooden stable. It had green moss glued to the roof. I loved it. I wonder where it is. One year the best "side" of the Christmas tree had quite a large bare spot, dead center. I stuck the nativity scene there. It looked wonderful. I even have a Christmas tree skirt that is 30 years old on which I appliqued a felt nativity. I have a couple of children who groan every year when it is brought out. I haven't found one to replace it yet that I like better. The children or the tree skirt. 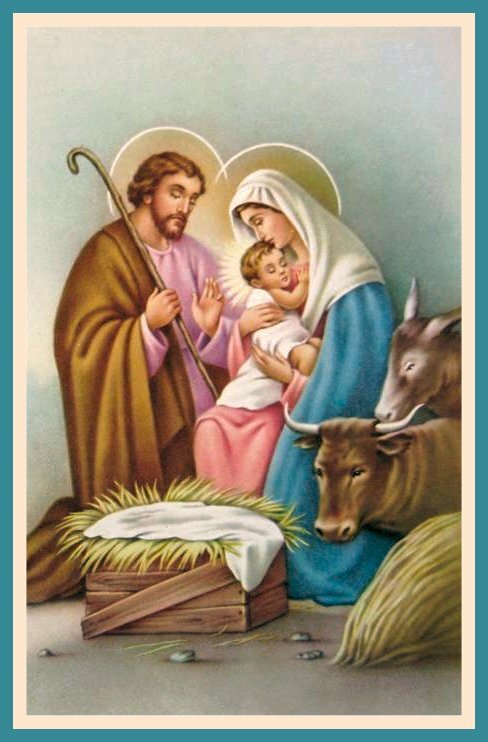 We send greeting cards every holiday season with nativity scenes. I am not able to send a Christmas card with Santa on it. I love Santa, I just can't send a card with Santa on it. It is just not in me. 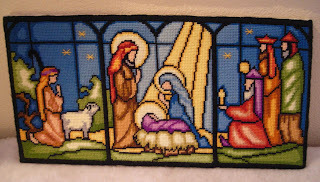 And of course you knew I would find it; there are needlework examples of nativity scenes as well. 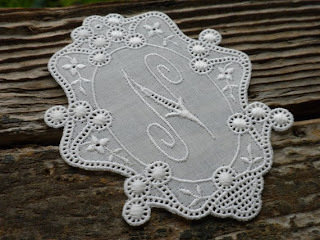 This lace card is beautiful. I had the UFO for this needlepoint kit somewhere. I have no idea if it is still buried in this house somewhere. I got quite far on it. It is beautiful and this person did a delightful job on it. Mine, not so much. 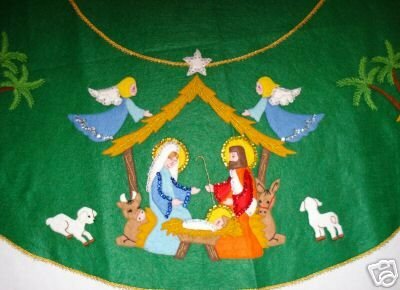 And there are several examples of smocking plates that feature a nativity. This is a ready to wear bishop out of what looks like navy velveteen. Just gorgeous. Our little world traveler is back from Paris. I think she grew a foot while she was gone. It must have been the hot chocolate and madelaines she had while she was there. Not. But the ones mommy had were very yummy I hear. She is modeling a new frock from my friend, Dawn. It is cozy warm. The smocked bishop top is a twill with corduroy cuffs. Can you say baby jet lag? 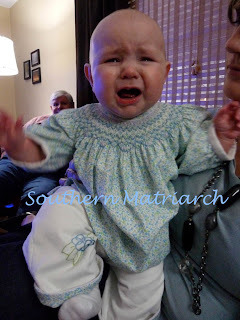 Her schedule is topsy turvy right now and she isn't very happy about it. And as you can see she is not getting much sympathy from her mother as she has a teeny little fit. You can see her cozy warm corduroy pants trimmed in the same twill with matching embroidery at the knee. What a little world traveler! Such a different world today. Beautiful little baby girl in a really pretty outfit! 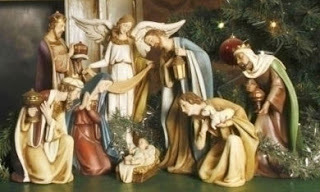 I love nativity scenes too and really like that pretty blue bishop. I know what you mean about the Christmas cards. I have some goofy ones this year with Santas, reindeer, and all sorts of things and they are bothering me. I think I'll go get some real cards, with Nativity scenes. I was wondering when she would get home... that outfit is darling on her. Mum is the best. All of your pics are wonderful but your little love bug is the best! She is a doll! Jet lag is the pits, poor baby girl. 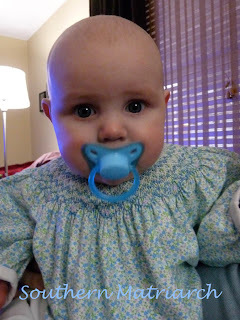 I'm glad the outfit is still big enough I was thinking she would probably have outgrown it while she was gone. Well, good morning! What an awesome post. 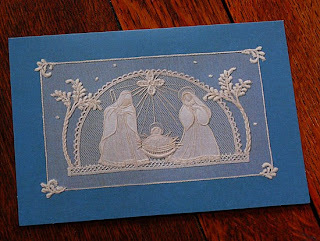 I loved the lace card best, until I saw the little sweetie! Goodness, made me laugh to see her big smile! Good she is learning that everyone is entitled to a fit now and then. I intend to throw a few this week! 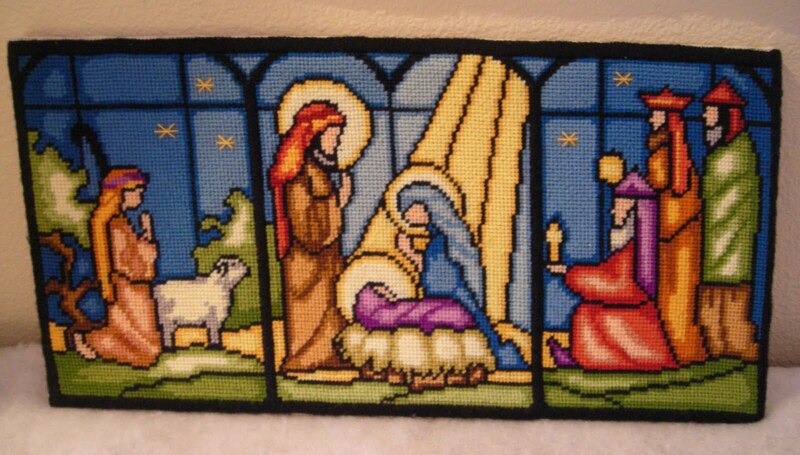 I have been admiring the bishop pictured above (royal blue velveteen with nativity scene). 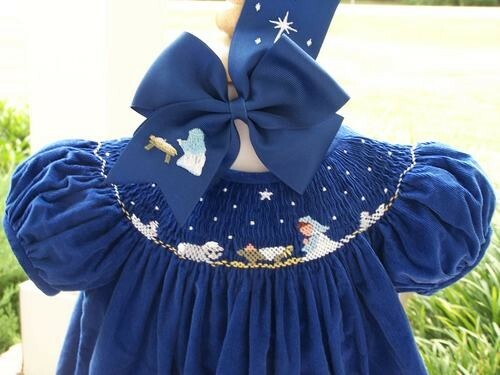 I desperately want to make this for my new great niece whose parents are deeply religious. It will mean so much more than a dress with santas or snowmen on it. But I have very little experience with picture shocking. 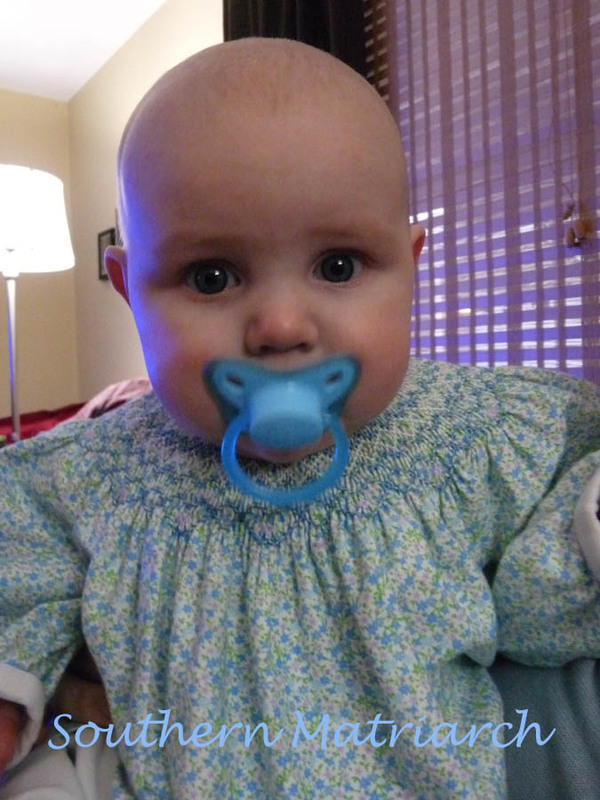 I've been doing geometric smocking for years(a lot of it). 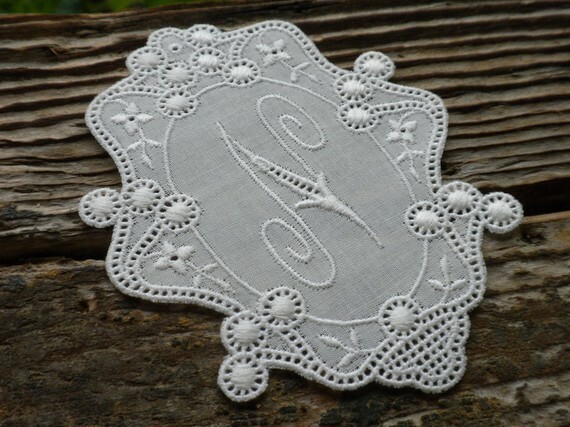 I am hoping that you know of someone that will design a similar smocking plate. Or if not, someone who could give me some tips on designing my own. I would be happy to hire someone if I can't find an appropriate plate. Can you point me in the right direction? Thanks in advance for any help you can offer!